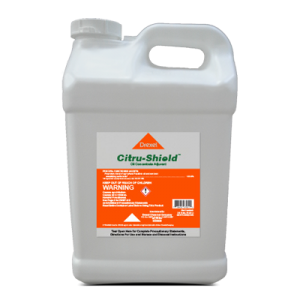 Citru-Shield™ is a blend of Agricultural Paraffinic oils and Surfactants that enhance wetting of leaf surfaces and provide more uniform active ingredient coverage. What percent oil is Citru-Shield™? Citru-Shield™ is 100% blend of Paraffinic oil. Can Citru-Shield™ be used on other crops? Yes, especially formulated for use on Citrus, but can be utilized in many other markets and crops.